It was a hot one at the Dacotah Speedway on Friday, June 10th. 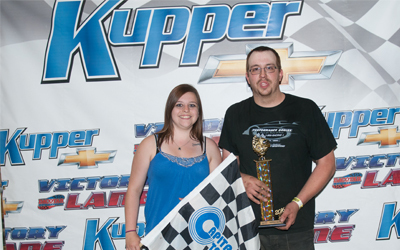 Fans and drivers braved the heat for a great night of racing. Rookie driver Shad Pederson started on the pole alongside Alex Thompson in the IMCA Sport Compact feature. Thompson led the first lap before a caution regrouped the field. On the restart, Thompson and his father Stan, raced side by side for the lead. Coming out of turn four and to the Open Road Honda start/finish line, Jason Berg and Josh Roehrich made it a four car battle for the lead. Roehrich shuffled into the lead with Berg all over his rear bumper. As Roehrich contended with Berg for the lead, Josh Houn, Chance Seelye and Stan Thompson raced three wide for third. Seelye split Houn and Thompson with three laps to go. 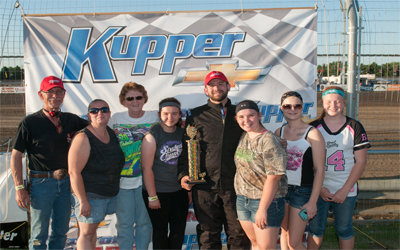 As the laps wound down, Roehrich pulled away and went on to pick up back-to-back feature wins at the Dacotah Speedway. Jason Berg finished second ahead of Chance Seelye. Dylan Sandberg, who started 14th,made a last lap pass on Josh Houn to finish fourth. Cautions came early and often in the Hobby Stock feature.Dylan Thomas grabbed the lead before a lap one caution. Cautions bred cautions which allowed Jeremy Engelhardt and Josh Roehrich to race three wide for the lead on the fourth restart on lap three. Engelhardt shuffled into the lead while Thomas and Roehrich raced door to door for second. Wishek, North Dakota's Brent Vetter made it a three car battle for second before another caution slowed the pace on lap five. Engelhardt pulled away on the restart before yet another caution regrouped the field with seven laps to go. On the restart, Vetter passed Roehrich and Thomas to challenge Engelhardt for the lead before Chris Welk Jr spun, bringing out the caution. Track officials ended the race six laps early due to the drivers extending their time limit. 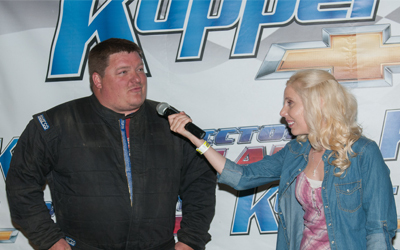 Jeremy Engelhardt was credited for the feature win. Brent Vetter finished second ahead of DylanThomas, Keith McCleary and John Gartner Jr.
*After the conclusion of the Hobby Stock feature race, tech officials disqualified Jeremy Engelhardt for illegal race parts. If the parts are deemed to be illegal, Brent Vetter will be the official winner. It was a five wide battle for the lead going into turn one in the INEX Legends feature. However the end result was horrific as Preston Martin's car suddenly turned right into pole sitter Austin Wiest, sending Wiest's car rolling over Drew Papke. Thankfully, all drivers involved were ok.On the restart, Troy Hoff stormed to the lead using the high line around the track. Veteran Ivan Sailer followed Hoff around the highline, passing Nate Keena for second. Donavin Wiest and Shane Williams moved to the high line as well, dropping Keena back to fifth. However, Keena fought back on the low line and found some speed. Hugging the guardrail, Keena rallied back to retake fourth from Williams, third from Wiest and second from Sailer. With six laps to go, Keena caught Hoff and challenged for the lead. Seeing Keena's new found speed, Williams moved to the low line, quickly passing Wiest and Sailer. Keena's low line prevailed as he took the lead with five laps to go, bringing Williams with him. Williams was all over Keena's rear bumper but Keena held on to win the feature over Williams. Points leader Donavin Wiest finished third while Troy Hoff and Ivan Sailer rounded out the top five. Beulah, North Dakota's Allen Frederick led from the pole in the WISSOTA Street Stock feature. Frederick's lead was under pressure from his son, Zach Frederick and John Feist. Zach Frederick, running the low line,grabbed the lead on lap four, bringing Jeremy Engelhardt with him. Allen Frederick now had his hands full with Feist and Travis Ulmer. It was a three car battle for third between Allen Frederick, Feist and Ulmer as Zach Frederick pulled away. Back-to-back cautions with eight laps to go regrouped the field and on the restart, Engelhardt dove low under Frederick to take the lead with six laps to go. The final caution came with five laps to go and on the restart, Zach Frederick retook the lead. Engelhardt challenged on the high side of the track but got too high in turn four with two laps to go, allowing Allen Frederick to slip by for second. After struggling for much of the season, Zach Frederick went on to win the feature over his father Allen. Jeremy Engelhardt had to settle for third ahead of Travis Ulmer and Barrett Berg. Jason Wolla stormed to the lead in the IMCA Modified feature. Wolla pulled away quickly as John Corell had his hands full trying to hold off Marlyn Seidler for second. The low line was the fast line as Tracy Domagala tried to find a way around Drew Christianson for fourth. As Wolla started catching lapped traffic with 12 laps to go, Domagala passed Christianson for fourth place. While racing for sixth place, Donald Robinson got into Travis Ulmer, bringing out the caution with eight laps to go. However, Wolla pulled away once again on the restart. Points leader Seidler passed Corell for second, bringing Spencer Wilson with him. Wilson, working in the high line, passed Seidler with four laps to go. 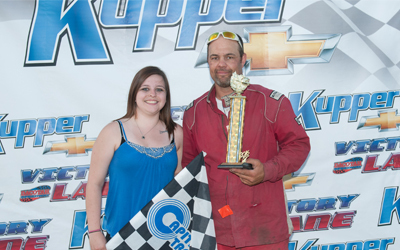 Jason Wolla led all 25 laps to win his second feature victory at the Dacotah Speedway this season. Spencer Wilson finished second as points leader Marlyn Seidler finished third. Drew Christianson made a last lap pass for fourth putting John Corell in the fifth finishing spot. 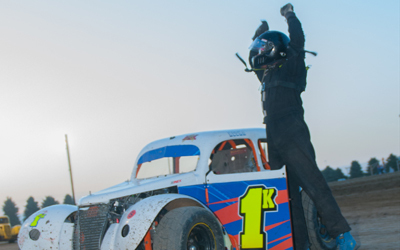 RDO Equipment brings you the Dakota Legends Tour plus IMCA Modifieds, WISSOTA Street Stocks, Hobby Stocks and IMCA Sport Compacts on Friday, June 17th. Front gate 6pm, green flag at 7pm. Dacotah Speedway is a high-banked, three-eighths-mile clay oval located at 2500Longspur Trail, just to the south of Memorial Highway, Mandan, ND.